We took the next exit, turned around, and sure enough, our wheel cover had come to rest beside a very busy freeway. Miraculously, the flying piece of aluminum had flitted (and shined) its way through traffic without scratching any other vehicles, or causing a multiple-car accident. It was at this point that I realized the value of having wheel covers (I call ‘em hubcaps). 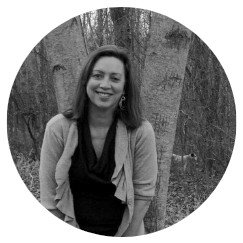 It seems you don’t really think about your hubcaps, but you sure notice when one is missing. We recently took a mini-vacation to Arkansas. Along the way on U.S. 63, I couldn’t help but notice “Mom and Pop” businesses along the highway, with the standard fare of ceramics, yard ornaments and a few used cars. 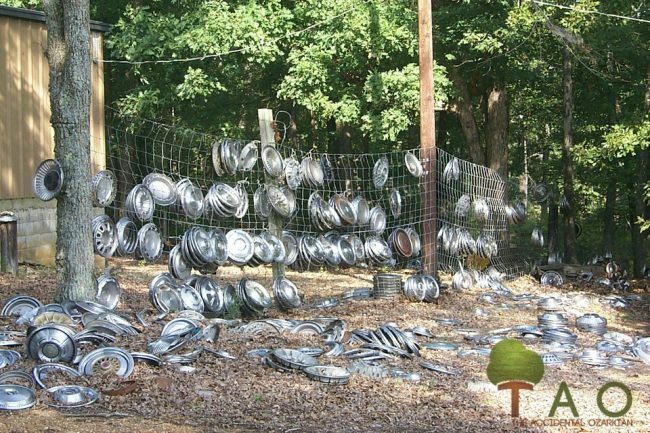 Then my son noticed a yard just full of hubcaps, surrounded by a fence with several more hubcaps on it. Being a teenage boy automatically qualifies him to be extremely interested in automobiles and all things involving automobiles and he wondered if maybe this would be a good place to stop. We pulled off the road and into the driveway of Bill and Kathy Hosman. Bill was sitting on his lawn tractor, mowing the ditch, and Kathy came out of the house to greet us. Bill stopped mowing, and graciously agreed to tell us about his business, even though we weren’t in the market for a hubcap. But you never know . . . In 1985, Hosman moved his business closer to home. He decided to organize his inventory in a nearby shed, trying a method or two before settling on using foot-long landscaping nails, placed at an upward angle on 2×4’s. He hangs the hubcaps in sets on the nails. 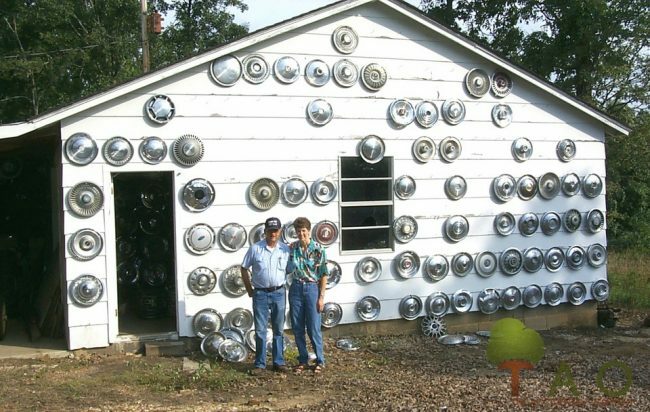 Bill buys most of the hubcaps from wrecking yards, in Little Rock and other places. He travels some in the region, including Missouri, to buy hubcaps from businesses, too. Now that he’s a retired locksmith, he enjoys dabbling in the hubcap business—that is, when he’s not taking his restored tractor to farm shows. Kathy also travels with him. 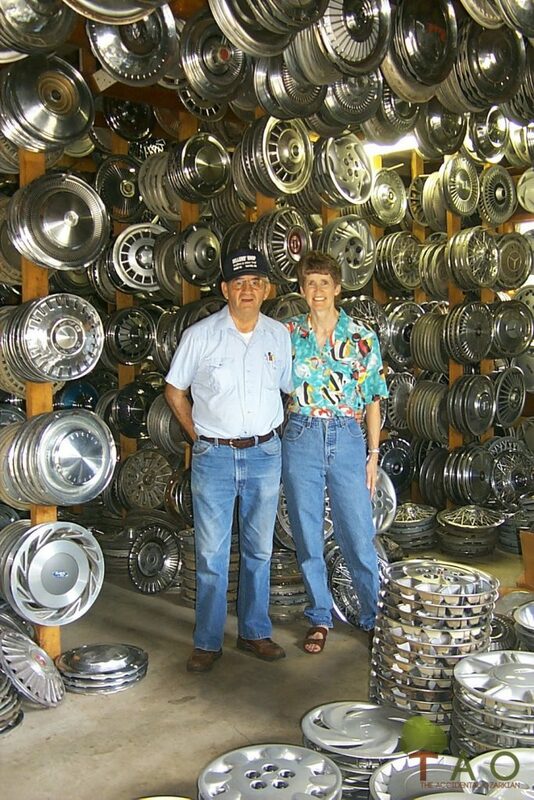 A retired schoolteacher, she seems to enjoy the hubcap business, and she’s even found a way to add that feminine touch to the shop—with a little pile of potpourri placed into an upturned hubcap. 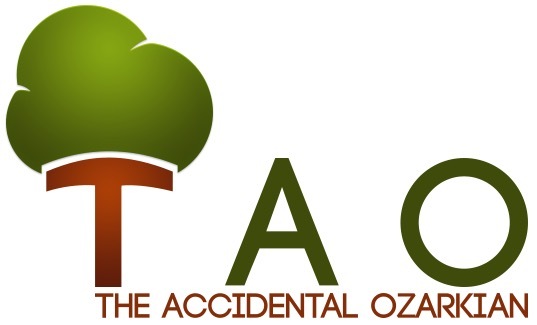 Bill says the store is open “everyday when I’m here,” and it’s located about two-and-a-half miles south of the Missouri state line on U.S. 63, and about the same distance north of Hardy, Arkansas. First published in The Ozarks Mountaineer, 2002.